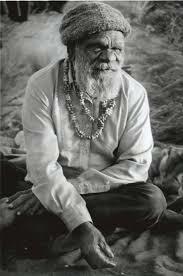 My old friend, the Aboriginal elder, Nosepeg Tjupurrula, tasted his first corn fritter when he was in his 70s, during a journey that took us to the remote and long-deserted base camp of the legendary 1930 Lasseter expedition. 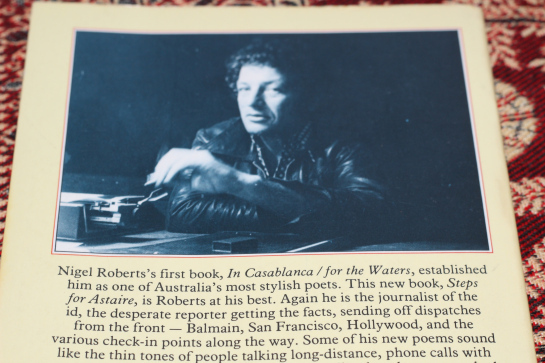 A group of us were camped out there in 1987 during the course of shooting a major documentary film chronicling Nosepeg’s extraordinary life. The unit manager/cook on the shoot was the poet, Nigel Roberts, whom Nosepeg had affectionately christened “Cookie rama-rama” owing to the fact that Nigel’s eyes had become increasing red and swollen and wild-mad after a week’s worth of campfire smoke in his face. Nigel, who was always the consummate host in his Bamain digs in Sydney, was once again playing the noble role of ‘mine host’, but this time way out the the hinterland of Central Australia, what is some times referred to as ‘the back o’ beyond’. I thought it might be timely on the eve of the new year to resurrect Nigel’s illustrious desert corn fritter recipe. Cornmeal is often used for corn fritters, but Nigel had his own ideas, preferring corn fritters that were lighter – almost a corn puff really. Nigel used a pretty standard fritter batter, and had several cans of cream corn in tow, which he claimed was even better for a tasty desert fritter than the fresh stuff. And I’d have to agree with him – the tinned cream corn actually works very well, making the fritters moist and tender. You’ll only need half of the can for a normal batch, unless you double it, so save the other half for some more fritters the next day, because frankly, you’ll probably be wanting some more. Nosepeg did. They are, what you might say, quite addictive. Fritters are really just little balls or patties of fried dough that can be a vehicle for just about any seasonal veggie that can be sliced, chopped, shredded and squeezed, or cooked and mashed – squash or zucchini, carrot, potato, sweet potato, corn, peas, and sometimes a combination of many of them – all come to mind as fair game for your deadliest fritters. Fruit can also be used, the most popular being apple. But peach, pear, banana, pineapple, and even berries also hit the spot. Crikey, back in Sydney, Nigel would make the most mouth-watering seafood fritters using crab meat, shrimp, fish and yabbies. 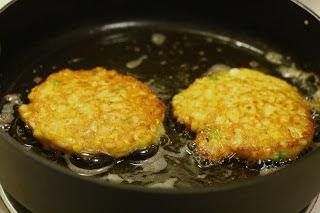 All you’ll need to do to make a variety of fritters is make adjustments with the seasonings and the moisture level of the batter, and remember that some will work better as skillet fried cakes (which works best when you’re cooking over an open fire in the desert), whilst others are better when dropped into a deep fryer. No need to get to fancy either. Serve them plain, with salsa, or your favorite dipping sauce. Nige employed a smokey barbeque sauce, as I remember. For those who like salty sweet combos, drizzle a little maple syrup over them. In a large bowl, stir together the corn, flour, egg yolks, onions, salt, paprika, pepper and cayenne. Using an electric mixer, beat the egg whites until stiff peaks form. Stir one-quarter of the beaten egg whites into the corn mixture. Using a rubber spatula, gently fold the remaining egg whites into the corn mixture in three additions. In a large skillet, heat the oil and butter over medium heat until the butter has melted. Carefully drop some of the corn mixture by tablespoons in to the hot oil, taking care not to crowd the pan. 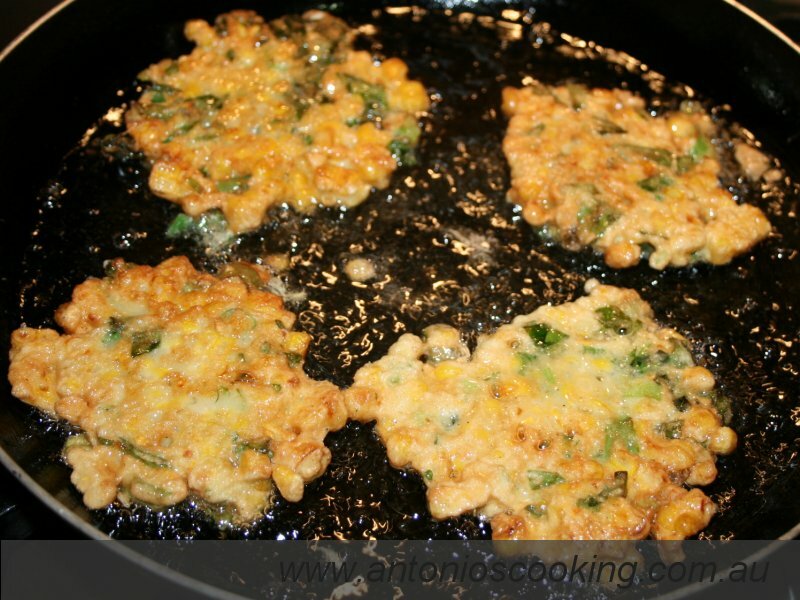 Cook each fritter until browned, about 2 to 3 minutes. Turn each fritter over and brown the other side, about 1 to 2 minutes. Remove the fritters to a platter lined with paper towels. Sprinkle lightly with salt, if desired. Repeat until all of the corn mixture has been used. Serve hot with some broiled tomatoes, a salsa made with chopped avocado, mango, lime and cilantro, and sour cream, if desired.